Reduced to clear! (normally $89) Stereo gaming headset: pure analog audio for accurate, optimal reproduction of the sound of games on your PC. 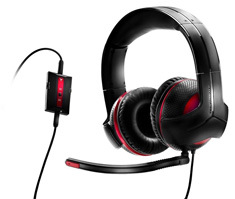 Crystal-clear audio, via premium 50 mm drivers, controls are at your fingertips, thanks to the multifunctional controller on the cable, unidirectional mic, designed to accurately target just your voice and ultra-soft ear pads and a headband covered in thick, soft foam padding for extreme comfort during long gaming sessions.